On previous expeditions I have carried the original paper maps, posting them home from points of civilisation with pre-paid envelopes once they had served their purpose. The advantage was that I had the full maps available at all times, but had to put up with extra weight. On more recent trips I printed the relevant sections of the route on to waterproof Toughprint paper using the likes of MemoryMap, Quo and Anquet or web-based route planners like Grough, Trailzilla and Walk Highlands. Although this approach saved weight, I sometimes found myself lacking the wider map area and context needed in an emergency or for a detour. All the time I looked enviously at the impressive range of maps for the National Trails produced by Harveys. As the Cape Wrath Trail is a less formal route, I doubted whether we'd ever see an equivalent. 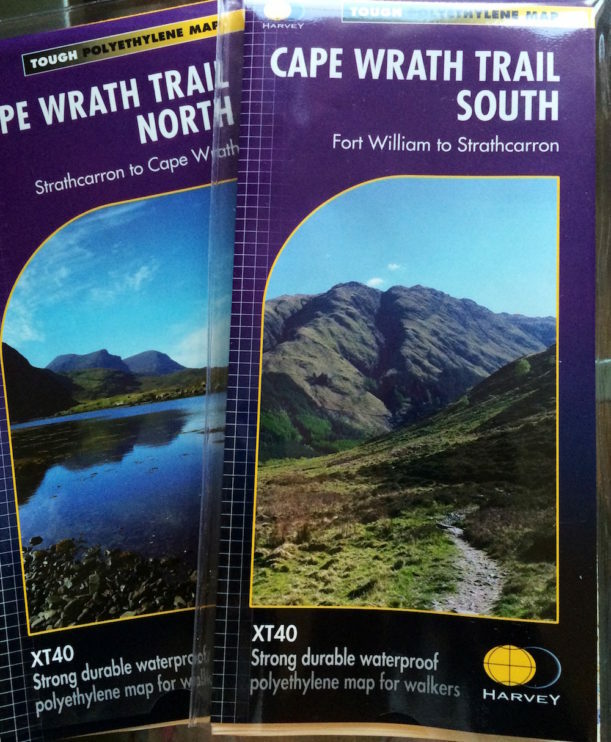 That was until May when the company released two new maps for the Cape Wrath Trail and in doing so answered the prayers of many a walker. Many swear by Harvey maps, and their BMC series covering Britain's main mountainous areas has become popular with guides. The 1:40,000 scale (sometimes referred to as the "magic scale") provides a balance between scale and detail and the shading used on the topography is also much loved. I've found that they take a bit of getting used to if you're familiar with OS maps, but once you do they are a pleasure to read and it is for good reasons they are favoured by the main mountain marathons. A further boon is the fact that they're waterproof and printed on a lightweight plasticised material. I can vouch for this as I dropped one in a stream on the West Highland Way with no ill effects. Although fitting such a long route onto two maps has necessitated a narrow strip view of the sections, if you are carrying a GPS device, you could get away with just these maps as an accompaniment, however, in places they lack the broader context that would be needed to make an escape from some of the remoter sections. In terms of the route, it mostly follows that which I set out in my guide pretty closely and lists a range of sensible detours or alternatives that have also become established. There are only a couple of inclusions I would take slight issue with. The maps follow suggestions from previous guides and include the section that descends to Attadale and then continues to Strathcarron on the road. In my view this is definitely not recommended. I've walked the road and it is fast with several dangerous blind bends and should be avoided unless in an emergency. There are other far better options to get to Strathcarron and this alternative has no obvious benefits. On the final stage from Sandwood Bay to the Cape the maps suggests a route that clings to the coastline. Having walked this route many times, I'd still suggest the route that is outlined in the guide that tracks the contours further in land. Some rivers (particularly the Keisgaig) will be harder to cross by the coast when is spate, and the view is just as good from further inland. These small points notwithstanding, these excellent new maps provide a great resource for cape wrath trailers in years to come. They can be purchased direct from Harveys. (yes, you can get them cheaper elsewhere, but Harveys are a small company worth supporting and provide an excellent mail order service).